The Modi phenomenon was long in the making, and will likely outlast Modi's prime-ministerial tenure. But with just a year to the next election, most analyses still misread it. Poor economic growth and job-creation, deepening agrarian distress, rising caste and religious violence, and numerous corporate scandals seem not to have dented Prime Minister Narendra Modi’s popularity among Indians. Recent surveys suggest that two-thirds of them approve of his leadership, the same as his approval rating four years ago. What accounts for this popular support? What explains the Modi phenomenon? To supporters, Modi’s political appeal springs from a host of factors. Unlike his predecessors, Modi seeks to deliver the fruits of development to all Indians and not just to a specific caste or religious segment, takes “bold decisions” such as demonetisation and the surgical military strikes against the country’s foes, proudly affirms India’s majority Hindu culture, and strives to raise the country’s stature internationally. Further, Modi’s humble origins and “self-made” credentials are in step with a generation that values “merit” over the pedigree of his main challenger, Congress party president Rahul Gandhi of the Nehru-Gandhi political dynasty. Critics attribute different reasons for Modi’s seeming popularity. Some contend that the approval ratings are artefacts of “bogus research” and unrepresentative surveys. His party’s electoral successes – another barometer of popular support – are not reliable reflections of voter satisfaction, because they are upshots of a superior political machine that micromanages the local electoral arithmetic and stokes religious animosities to consolidate Hindu votes. Others hold that Modi’s broader appeal is a function of his ability to skilfully communicate with people; he is an “events manger” with a “flair for clever lines”; a “brand” that is carefully packaged, advertised and sold to the public. Both views capture aspects of Modi’s politics, but they miss a substantial factor that is behind its rise and relevance. This factor not only underpins the Modi phenomenon but is also transforming Indian politics in fundamental ways to suggest that Narendra Modi may merely be a warm-up act. The tidal shift underway in Indian politics that nurtures the Modi phenomenon has a generational component to it. But it is not what the media describes as the aspirational generation, the post-liberalisation “Generation Y”, or the new nationalistic middle class, because it involves new voters in their late-teens and older ones in their mid-forties, people who are not yet part of the middle class and those in their well-to-do mid-careers. The principals who propel this political shift are those who came of political age in the post-Emergency era: people born in or after the 1970s. What unites most members of this post-Emergency generation – and sets them apart from preceding generations – is a shared political outlook made up of three key elements. First, the post-Emergency generation doubts and discounts democratic institutions and politics. This disaffection with democracy is evident in the responses Indians gave in the World Value Surveys. 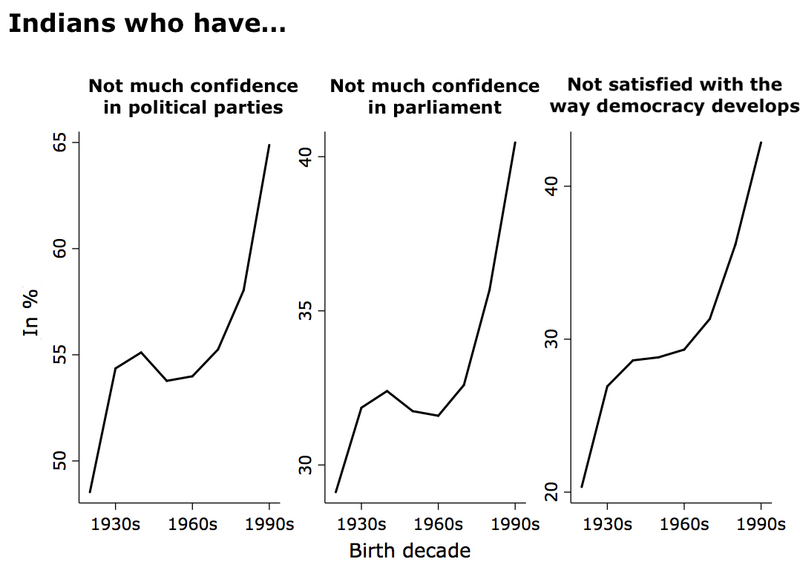 On questions about democratic institutions – such as those on political parties and the parliament – or on how democracy is developing in the country, the post-Emergency generation has markedly negative views than those of earlier generations. 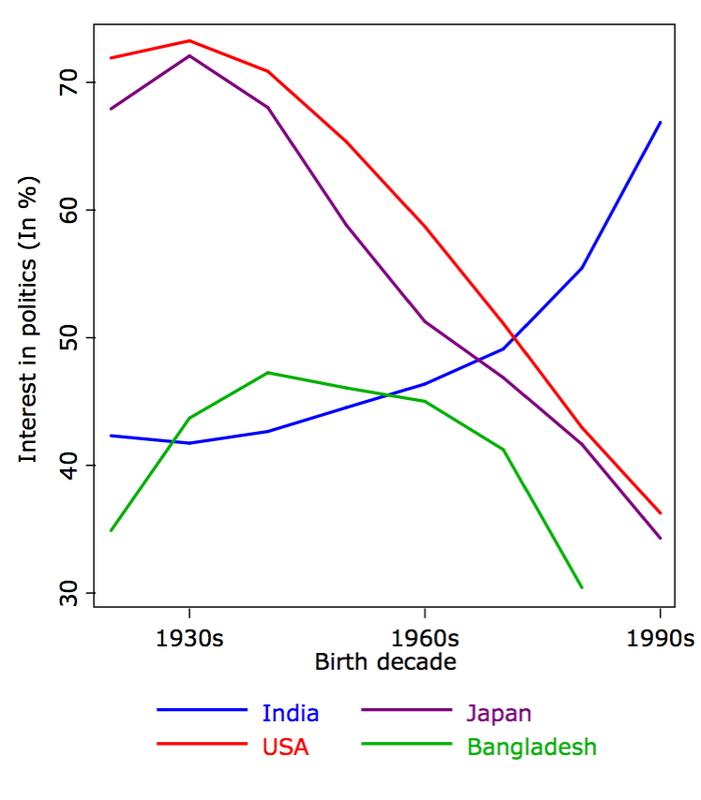 If Indians are arrayed according to the decade in which they were born, a sharp inflection in survey responses takes place in the 1970s – that is, the people who came of age in the post-Emergency decades have far greater dissatisfaction with democratic politics than their parents or grandparents. The reasons for this generation gap may lie in the differences in lived experiences. Older Indians learned about politics from newspapers and the radio, news vetted and curated for them by editors with some shared journalistic standards; the post-Emergency generation saw raw politics, often live and increasingly unmediated, on television sets and over the Internet. From newspapers and radio, the older generations learned about the spirited parliamentary debates on the ideas and policies shaping India; the post-Emergency generation saw less edifying spectacles in the parliament. The first parliamentary event the oldest members of the post-Emergency generation saw on television after they came of voting age was perhaps the messy jockeying by Chandra Shekhar and V.P. Singh to be the prime minister. Those born later would see elected members flaunting wads of alleged bribe money in parliament, and legislators being prosecuted for taking money to ask questions in parliament. Pre-Emergency generations too saw these events on television, but they also knew from earlier experiences the dynamic effectiveness of the parliament – its legislative and policy brio had transformed the country in their lifetimes and lifted many millions out of illiteracy, ill health, and poverty. Thus even when the older generations of Indians see falling political standards, they seem to hold a measured evaluation of India’s democratic experiment. In contrast, the post-Emergency Indians – whose lives coincided with frequentlydeadlocked parliamentary sessions, legislative inactivity, and criminalisation of politics – avow profound disaffection with democratic politics. Such disaffection often begets political alienation. In several countries, as economic developments have made lives less dependent on political decisions than before, political disaffection has turned many young people away from politics; they are just “switched off”. India’s post-Emergency generation is anything but switched off from politics. Compared to their peers in some developed and developing democracies or their parents, post-Emergency Indians show greater interest in politics. The second element of the political outlook that unites the post-Emergency generation and distinguishes it from the older generations of Indians is this heightened interest in politics. The third key aspect that makes up the political outlook of the post-Emergency generation is its ideological affinity. 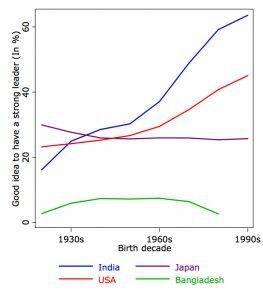 Discontented with democratic politics, most Indians born in or after the 1970s gravitate towards its political antithesis: authoritarianism. Compared to the generation born at independence, there is a two-fold increase in support for a strongman leader for the country among post-Emergency Indians. The three trends – greater disillusionment with democracy, heightened interest in politics, and increasing preference for a strongman leader – amalgamate in a new political culture that seeks answers to the country’s concerns in a political redeemer who can sideline the parliament and run roughshod institutional checks and balances to implement his political agenda and vision. In essence, it is a political culture with firm authoritarian tendencies, and is deepening with every passing decade. An undercurrent of authoritarianism existed all through modern Indian politics. During the struggle for independence, it manifested in Subhas Chandra Bose, who espoused a political culture for India that fused the repressive traits of Communism and Fascism. Indian offshoots of Fascism – the Rashtriya Swayamsevak Sangh (RSS), for instance – consistently channeled into the polity a rip current of political machismo. The Indira-Sanjay Gandhi duo brought imperious rule to India’s political centre in the Emergency years. Yet, authoritarian ideas and politics held only scant appeal among ordinary Indians. Indira Gandhi’s resounding defeat in the 1977 election is a testament to popular aversion to overbearing leadership. A robust majority of Indians cherished its tryst with democracy and, it seems, drew a Lakshmana rekha in national politics to keep megalomaniacs at bay. Authoritarian tendencies were thus historically limited to political mavericks or the margins. This, however, changed by the 2014 election. For the first time, the post-Emergency generation became a decisive majority in the electorate, thrust authoritarian tendencies into the mainstream political culture, and set the stage for a strongman to clinch power. Modi’s entry into national politics that year, with his tough guy persona and reputation for autocratic rule, gelled well with this cultural transformation. So much so that the BJP’s electoral success was misread as the “Modi wave”. In fact, Modi merely rode to power on the back of a political wave that was long in the making – a wave the underlying shift in political culture threw up. Modi is a symptom rather than the source or substance of that deeper tidal shift that is shaping politics. 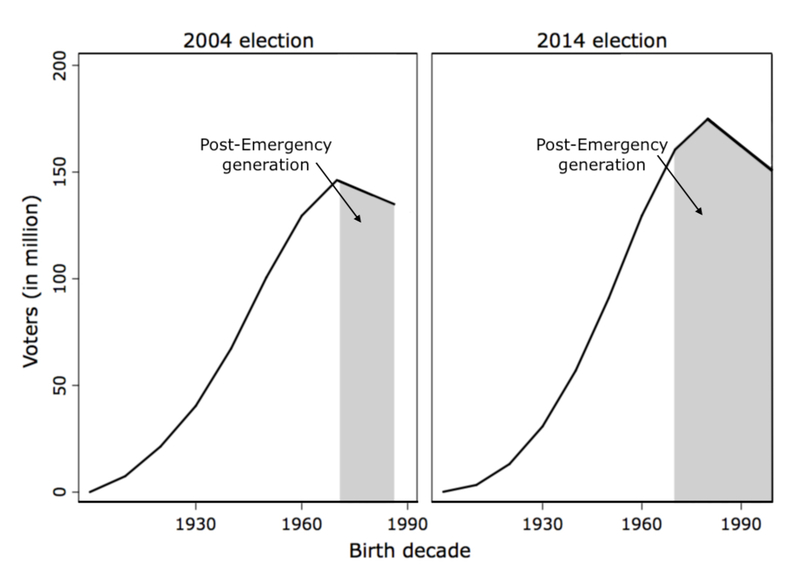 In 2004, the post-Emergency generation made up only 46% of the voting population; by 2014, it had risen to 68%, constituting a decisive majority in the electorate. Sources: Election Commission of India, Census of India. And Indian politics can expect more – mightier – waves set off by that cultural shift in the coming years. As pre-Emergency generations slowly pass on and the post-Emergency generation starts to fill up the electorate, authoritarian tendencies will not just be a part of India’s political culture; it will be its dominant current. It is then ill-founded to hail every electoral or legislative setback that the Modi-led BJP suffers – in Bihar, Gujarat, Uttarakhand or Uttar Pradesh – as a victory for democracy. With a pervasive political culture that fosters strongman politicians at the expense of democracy, these setbacks are at best temporary let-ups – deceptive calms before impending crashing waves. Thus, when the man with the famed “56-inch-chest” one day fades away, another strongman would likely replace him much like Modi himself had edged out the loh purush (Ironman), L.K. Advani. Indian democracy need not be doomed, however. Political culture is not set in stone. Just as it had drifted towards authoritarianism when democratic institutions were systematically degraded, it could once again become a repository of democratic attitudes if the parliament and other political institutions are revivified. But until then, the seeds of democracy’s destruction will be sown across India, ironically, in polling stations; and strongmen leaders will prevail even beyond the current incarnation. 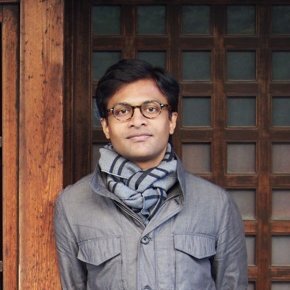 Anoop Sadanandan is author of Why Democracy Deepens and tweets @SadanandanAnoop.